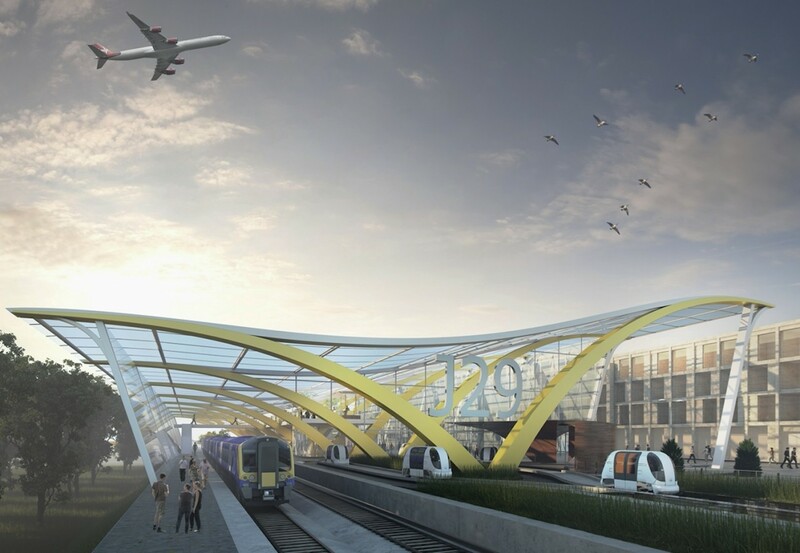 The holy grail of introducing a rail service to Glasgow Airport has taken a fresh twist with plans to introduce a personal rapid transit (PRT) system – one of two options currently being weighed up by Glasgow and Clyde Valley Cabinet after plans for a heavy rail link were scrapped. Under two competing proposals for City Deal funding the route would be serviced either by a £144m tram/train option to Glasgow Central via Paisley Gilmour Street, which could reduce airport journey times to just over 16 minutes. 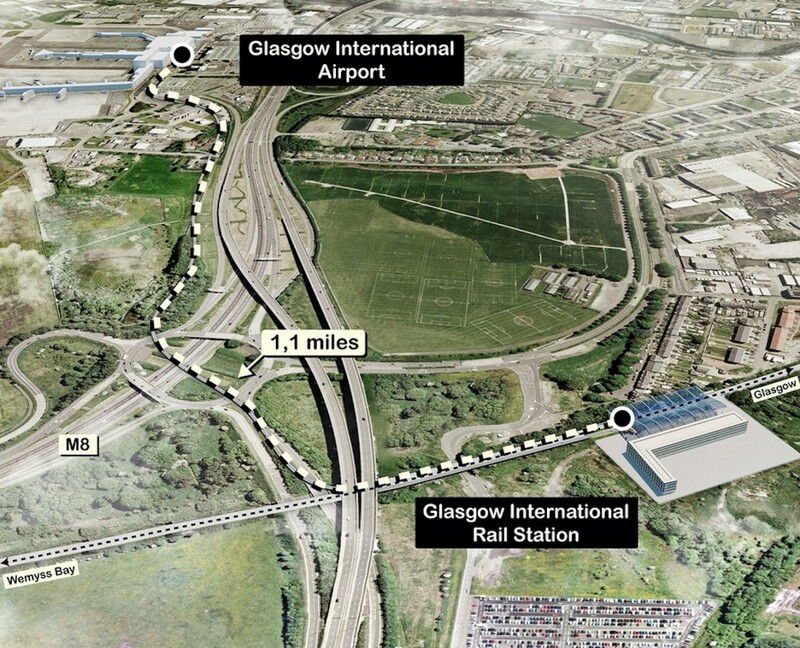 Alternatively, the £80m PRT system may get the nod, linking to a 'Glasgow International Railway Station' in four minutes it would take just 12 months to build. This would see a fleet of small automated pods shuttle between the two stops on custom-built lightweight guideways. The idea has already received the backing of Junction 29. Landowner of a 40 acre site at the airport. 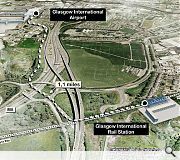 Its MD, Paul Kelly, said: “The PRT option…would significantly ease congestion on the M8 corridor between the airport and the city centre. Our PRT solution is very similar to what is already in place at London Heathrow Terminal 5, which is very reliable and has high levels of customer satisfaction. A final decision is expected to be made by December. The photo caption is wrong - it's St James that's being relocated, not Gilmour Street. Also, I've been thinking lately that the Glasgow Central / Glasgow Airport route might be a good candidate to introduce driverless vehicles to Scotland in a few years time. It's a short drive along Waterloo street onto the M8 and straight to the Airport. Almost an entirely pedestrian-free route. I also have serious doubts about whether this would be up and running within 12 months. In fact, I don't believe it for a second. Accessing the station via the Wemyss Bay line, using two trains / trams - seriously! Can't we come up with a dedicated link direct to the airport, possibly serving Braehead. Clearly the planners / engineers behind the scheme, haven't lugged luggage and kids to the airport. Interesting technology but a very poor design / layout for the airport link. It should be linked with Paisley Gilmour Street so that the number of connecting trains is doubled. Technology -- Could be either of two. The Heathrow pods described in the article or a Doppelmeyer shuttle set up. The tram train plan is just me too nonsense from a Civil Service that cannot see past anything new in England. 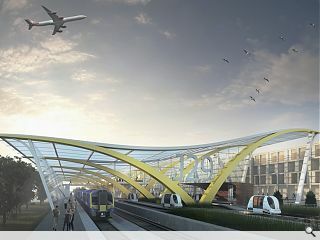 The tram train option would be a railway to nowhere, a cul de sac, a one club transport golfer that would not provide the range of destinations that the airport needs to be a player in the airport business. Fixed link from Paisley Gilmour Street plus the City Union Line and the airport would start to have real connections with the rest of Scotland. The whole thing looks wrong ,Even the Monorail idea was more feasible! But really it should be a train nothing else,If it really has to be any of the 2 options then it should be tramtrain.Dont see them building this pod thingy in a year!!! Or they could bite the bullet and begin the process of expanding the Glasgow Metro system by having a dedicated "Airport Line" tunnel. Or even build a new "Western Loop" which could incorporate a large, main Airport Station or Terminus or something. The Metro will have to be expanded at some point. Do it now. Doppelmayr are the people who make the rope way shuttles. 2200/2400m -- PGS to Glasgow Airport. Meat and drink to this technology. Would turn the railway station into a terminal of the airport -- put a bit of life back into Paisley city centre. Paisley is full of gap sites so generating a route should not be that difficult. Following the river would seem to offer a lot of potential. The pod idea has merit. However locating it at Jn29 would seem to be a airport car park scheme with a nearby train station. Paisley Gilmore Street should be used -- city centre location, twice the amount of trains and then some, close to the Canal Line and the local bus network. My preference would be the Doppelmayr technology but I think the Pod offering should be investigated. Interesting to see the differences in the physicals needed to support both. Scale of the vertical supports, the spans available, the gradients possible and the minimum curve radius of each system? Crossing the M8 will have its challenges but it should be possible to thread a route underneath at the river -- then up and over the local roads to get it to the original train station location. I thought the idea to link central with the SECC, Braehead, the Queen Elizabeth Hospital and the airport was a viable option and would increase passenger numbers. A link whichever form it takes should reduce car traffic to the airport and Braehead,SECC and the hospital if the aforementioned option is taken. There has been sufficient time already taken over the Airport link. Can we now just get on with it? We could be losing out to our competitors. If the Airport is tagged onto the end of a commuter system serving a number of traffic generators around the Clyde then it will be a second rate system for the airport. SECC / Glasgow Harbour / Hospital / Braehead means 30 minutes plus to the airport. If Braehead then why not Renfrew? If Renfrew then why not Govan? If the journey is 30 minutes plus then what about the bus? If the bus is then the quickest way to the city centre then why bother? Making PGS a public transport hub for the airport means existing train services can the used. 5 minute shuttle to the airport is a normal inter terminal event at a lot of airports -- actually less involved than quite a few. Life into Paisley city centre. Fixed connection from the airport to the city centre and a lot else beside. Bring the City Union Line into play. Not sure that people on their way to or back from the airport are going to want to cart their luggage around with them for a quick shop around Paisley. People wanting to shop in Paisley have that option just now via Paisley Gilmour St. I would rather do it without luggage and enjoy the experience. Think most people given the choice would not want to transfer luggage and children to another train if avoidable. At least when you are at the airport you can check in your luggage and you are free to enjoy the rest of your waiting /shopping time unhindered. It's good to consider all the options though. Suspect that it will come down to the cheapest option. Recently I traveled from London Victoria - Gatwick airport on the Gatwick express. It was an every 15 minutes service non stop. When disembarking at Gatwick we then boarded a pod to the terminal. Which I think could work an express from Central station to Glasgow airport station express non stop and then the pods into the airport also with dedicated branded platforms at central. Current arrangements from the airport to PGS are pretty rubbish. Service bus that goes round the houses is not what is needed. Plus you could never get the combined Train / bus ticket from the bus driver on a regular basis. It is a service set up to fail. Not a great advert for TS planning. My view from 2 years ago. Things could be better but I am not hopeful.